Our coaches are carefully interviewed and approved by the club and then provided with numerous hours of basketball skills training from our in-house trainer, Coach Gary Smith. In addition, every Wildcats coach is screened by the Amateur Athletic Union (AAU) and must complete all three levels of the nationally recognized Positive Coaching Alliance (PCA) training program. Our coaches must possess knowledge and love of basketball, but, more important, they must demonstrate a commitment to providing their players with a positive, character-building sports experience based on encouragement and respect. Junior Wildcats was developed by Wildcats High School coaches who feel it's important to introduce young children to the sport of basketball in a fun and well organized structure. These coaches have many years of experience with all ages of athletes, including high school. By aligning their knowledge of the high school methodology of playing basketball, they can ensure a seamless transition for the athletes as they develop and move up in age brackets. Steve joined the Wildcats coaching staff 10 years ago, bringing over 23 years of coaching basketball at the middle and high school level. For the past eight years he has been highly involved with the High School Wildcats program, leading both the 15U and 16U teams. Coach Sousa was the Head Freshman, Head JV and then Assistant Varsity coach for Archbishop Mitty High School in San Jose from 1994-2000. After relocating to Davis in 2001 he assisted numerous local Junior High and High schools throughout Yolo County before settling on the Wildcats. Steve lives in Davis with his wife Patti and sons Sam and Nick. 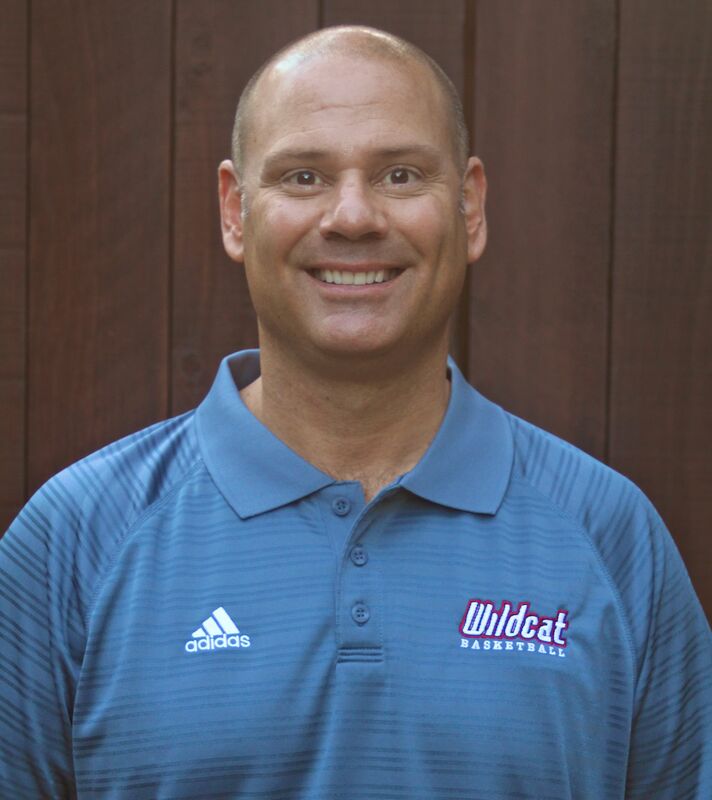 Jon Elson brings a life-long love of the game of basketball to Wildcats and has many years of experience working with youth in both academic and recreational settings. Last year, he assisted in coaching the Wildcats Developmental League (WDL). Jon played basketball all four years of high school and in a variety of intramural and city leagues after that. Jon grew up in the small town of Lindsay, CA. He came to Davis for law school in 2003 and has been here ever since. Jon and his wife Sruti have two amazing children, Devan (9) and Shalini (6). Jon’s “day job” is with a software company in the Public Safety industry. Fun Fact: Coach Jon is a solidly mediocre juggler and two-time fantasy basketball league champion! Tony Firpo has coaching in his blood, having grown up in the Burlingame High School gym, watching his dad coach the varsity boys basketball team and eventually playing for his dad. Tony now loves being back in the gym coaching his own sons. He has coached at the high school junior varsity level and with Wildcats. Tony graduated from Santa Clara and he loved watching Steve Nash play while Nash was a Bronco. Tony works for UCD and lives in Davis with his wife Christine and their three basketball-loving boys. Fun Fact: During Game 1 of the Sacramento Kings 2004 playoff series versus the Dallas Mavericks, Coach Tony hit a half-court shot and the Maloof brothers gave him a car! Charles King is a teacher in the Natomas School District where he has worked since 1997. He received a BA in history from Cal Poly San Luis Obispo. Charles spent several years coaching boys and girls 7th and 8th grade basketball. He stopped coaching basketball when his son was born but started to get back into it as his son showed an interest in playing. Charles and his wife (who is currently completing her Masters Degree at UCD) have a son in 5th grade and a daughter in 3rd grade. Fun Fact: Coach Charles currently works at Heron School teaching 7th and 8th grade social studies as well as running a video production club. Bryan Stafford loves the game of basketball and is thrilled that his son loves it even more than he does. Bryan played through varsity level in high school in basketball and baseball. He has experience coaching youth soccer, basketball and baseball. Bryan is a graduate of both UC Davis and Sacramento State. Be sure to ask him whom he roots for in the Causeway Classic! Bryan works for Genentech, Inc. in Vacaville. He lives in Davis with his wife Lori and their children Lindsay and Evan. Fun Fact: In junior high at the age of 12, Coach Bryan was 5 feet tall and wore size 11 shoes! He had to learn to be quick footed for basketball with big clown feet! Graham McDaniel is a baller. He played Wildcats from 4-12th grade and was also on Fairfield's 707's finest AAU team from 9-10th grade. He has been to many competitive camps and clinics in places such as San Diego, Florida, Los Angeles, Sacramento, and Benicia. He played point guard for 3 years on the Davis High School varsity team, and has continued to play as a starting point guard on the UC Davis club basketball team. Graham has coached city league basketball for 3 years and has assistant coached/helped out with the DHS varsity basketball team on and off for 3 years. This is his 2nd year coaching with Wildcats. He also enjoys playing guitar, hanging out with friends, hiking, and comedy. Fun Fact: Coach Graham is very interested in medicine and providing health care to underserved communities. He studies neurobiology, physiology, and behavior at UC Davis and is in his 4th year. He works at a student run clinic that gives primary care to the uninsured. He also works as a research assistant at the MIND institute. Miles Gray played junior varsity and varsity basketball at Davis High. He has coached youth basketball at a variety of levels including city league, Wildcats and Davis High. Fun Fact: Outside of hoops, Coach Miles’ priorities are the 3 F’s: friends, family and food! Michael Finerty (Coach Fin) has worked with Wildcats for many years and currently serves as a skills trainer with our 6th grade team, with a focus on shooting mechanics and offensive skill sets. Fin played basketball at Bellarmine Prep and at UC Davis. He is a General Dentist in Downtown Sacramento and lives in Davis with his wife Jenn and their sons Sean and Mikey. Fun Facts: Coach Fin guarded Sacramento mayor Kevin Johnson in college twice...the experience helped him to realize he needed to hit the books and pursue his dental profession! Coach Fin also turned down playing for Hall of Fame-to-be coach Greg Popovich when he coached at Div. III Pomona College in Los Angeles. Fin felt he was 'too good' for that program...all he knows now is that friends of his who did play for Popovich to this day get to go into the San Antonio Spurs locker room to hang with the team...hmmm. Kevin Lynch has multiple seasons of coaching experience in AAU basketball, most recently with Wildcats. He played basketball at Nevada Union High School and is a practice player for the UC Davis women’s basketball team. Kevin is about to graduate from UCD with a major in Exercise Biology and a minor in education. When he is not in class he is often seen on campus working events in the ARC and Pavilion. His passions and hobbies include working out, being active, and watching sports. Fun Fact: Coach Kevin has a phobia of shopping carts! The renowned Gary Smith is our Wildcat Coach Trainer. In his 36 years as the head coach at the University of Redlands, Coach Smith compiled more wins in the SCIAC than any coach in its history. He was named West Region Coach of the Year in 2007 along with the NABC Guardians of the Game Award for Education and the NABC D-III Outstanding Service Award that same year. His teams have led the nation in scoring 5 times with his 2004-05 team averaging and NCAA all Division record 132.4 points per game. Coach Smith and wife Carol moved to Davis after leaving Redlands to be closer to daughter Karen, son-in-law Jason and grandson Max. He has had previous experience with Wildcat Basketball when he assisted Steve Sousa with his 16U high school team. Carol & Gary enjoy fly fishing in the Sierras. Fun Fact: Coach Smith has had a close association with the German Basketball Federation for over 30 years conducting camps, clinics and touring with his teams in Europe.